Media-centric smartphone users, meet Dazzboard: An easy, lightweight and clean way to transfer media to your smartphone. Dazzboard runs on your browser, works with multiple phones and MP3 players (iPhones and iPods, of course, excluded) and is completely free. To get Dazzboard, you simply go to Dazzboard Web site, register for an account and then download the free browser plug-in. Also, make sure to check whether your browser and OS are covered by Dazzboard here. Dazzboard is still working on compatibility with Mac OS and there's no Linux support. First, you have to connect your phone to your PC and set it as a mass storage device. Dazzboard explains how to do this with different phone models in their FAQ. Once you're set up, you'll be able to view and manage all of your phone's content on the Dazzboard homepage. 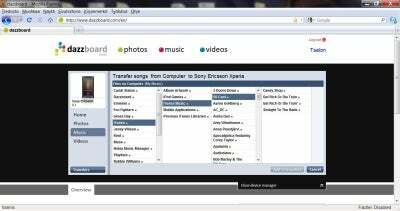 You can also transfer files from your PC to your phone, including your entire iTunes library. The Dazzboard user interface is very clean and incredibly simple as it shows thumbnails of your photos or albums so you know exactly what you're going to transfer. Dazzboard also lets you download content to your phone from your other social networking sites like Facebook, Flickr and YouTube with the "Dazz me!" bookmarklet. It is a quick download and worth it if you upload photos to various accounts. Dazzboard also has a nice user discovery aspect: Videos, music and photos from other sources appear on the site. You can then grab this content, place it in a transfer queue (which appears on your Dazzboard page) and then transfer it to your phone. I transferred a couple of lovely Hawaiian sunset photos from Flickr via the dazzboard site as well as a music video from YouTube and they transferred over to my phones with no problem (though it was a bit slow). Dazzboard calls itself an "open iTunes" and the name fits. Like iTunes, it is super easy to use, aesthetically-pleasing and lightweight. And even better than iTunes, it is open to a number of different devices. Of course, not every device is supported and you can't manage apps or contacts via Dazzboard. Dazzboard seems to be frequently adding more and more features and support and I look forward to seeing where they go next.